"This is a great recipe that I created after some experimentation. 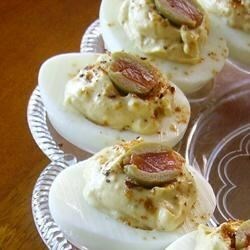 Barbeque seasoning is a tasty twist to deviled eggs." This is a really great recipe! I didn't think I'd like it, but I did! =) East to make + tastes good. Didn't care for this at all. ended up too runny and my family said they all preferred my version of deviled eggs. The taste was great, but it was WAY too runny! I would use half the amount of lemon juice and mayo or extra yolks. Not a fan of these. Waste of six eggs. Used the remaining eggs with one tsp mayo 2 tsps water, one tsp dry mustard and salt and pepper to taste. Came out yummy! Very good! I didn't have BBQ seasoning, substituted BBQ sauce.